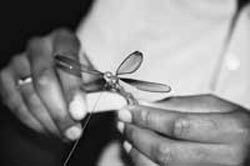 Bugz workshop provides employment for hundreds of people in the townships of South Africa and, more recently, Cuernavaca in Mexico, a small town not benefitted by tourism, where employment is hard to come by. Single mothers in particular are welcomed in the Bugz project which tries to be 100% flexible, to allow them to go to school meetings for instance as the educational authorities often take no account of single mothers’ needs. They work in a safe and secure environment with proper bathroom facilities. The Bugz Workshop was set up in South Africa, but the decision to open another workshop in Mexico was caused by the increasing violence in the townships – staff have had to face gangsters armed with AK47s and in the year before the Cuernavaca workshop was set up, 22 people in the near vicinity were murdered. This is a huge social problem, almost impossible for a small humanitarian project like this to deal with. This great enterprise makes a real difference to many people’s lives. Enormous emphasis is placed on training and meticulous quality control, to ensure the quality of the unique and colourful designs. These high standards ensure that the Bugz continue to sell brilliantly across the world, ensuring the livelihood of the workers involved.